Mary Minniti is a Certified Professional in Healthcare Quality and has over 30 years experience in the field. She joined the Institute for Patient- and Family-Centered Care in 2011 and works as a Senior Policy and Program Specialist. She was lead author on a Robert Wood Johnson Foundation funded report, Individual and Family Engagement in the Medicaid Population: Emerging Best Practices and Recommendations and IPFCC’s publication: Essential Allies Patient, Resident, and Family Advisors: A Guide for Staff Liaisons. 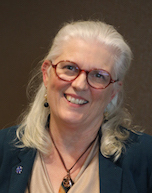 She currently serves on the Circle of Champions to advance the adoption of TCPI Person and Family Engagement Performance Metrics and provides technical assistance to TCPI PTNs and practices through the PCPCC SAN and the ACP SAN. She has been actively involved in Oregon’s health care reform work especially related to the primary care transformation. The recommendations of a taskforce she led established the Patient Centered Primary Care Home (PCPCH) Technical Institute. It serves to support clinics across Oregon in meeting PCPCH standards. As a Project Director for a collaborative statewide effort in Oregon on patient and family engagement, she provided support to a Medicaid health plan and four primary care clinics in establishing patient and family advisory councils. She worked for 16 years at PeaceHealth, an integrated health care system in the Pacific Northwest. Her last PeaceHealth position was as the Quality Improvement Director for PeaceHealth Medical Group, a large multi-specialty practice in Eugene, OR. Her passion is bringing patients and family members into conversations about health care transformation because of the positive and powerful impact it creates for all involved.